Rory Currie has had his loan extended. Darren Young has called for more of the same from his players when they host Greenock Morton in the Scottish Cup. The visitors are a Championship club, but East Fife have already shown this season in the Betfred and Irn-Bru Cups that they fear nobody from a higher league. And Young is calling for the same levels of application when Jonathan Johansson brings his side to Methil. 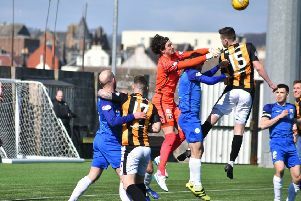 He said: “They’re a good, full-time side but if we have the same mentality as we did in the Partick Thistle, Queen of the South and St Johnstone games then we have a chance. The Methil men have a decent record this season at Bayview, but on the road they’ve also impressed. Saturday’s victory at Montrose made it four wins on the bounce away from home for East Fife. It was a win nobody could grudge the Fifers who looked good across the park. Young added: “We showed Montrose respect by putting an extra man in midfield. “During the game we tried to get up the park us much as we could and scored a couple of good goals. “Anton Dowds was great again and sets up the first goal for Liam Watt. “He had chances of his own as well and probably should have scored. “But he’s still really coming on after starting the season well. “The second goal comes from a great through ball by Ross Davidson which is something we’d been working on and had spoken about in training. While some clubs in the country are scrambling around to re-jig their squad during the current window, Darren Young admits he’s quite happy with what he has. The side is sitting nicely in third spot in League One and still involved in both the Irn-Bru and Scottish cups. Rory Currie, who missed Saturday’s win at Montrose through illness, has extended his loan from Hearts, but Young can’t see much more business being done. He said: “Rory Currie and Scott Agnew were missing on Saturday and they’re two big players. “But the players who came in made a difference in the game and it’s great to have that in the squad.